Having red hair takes a lot of upkeep, I've been a redhead now for over 7 years now and it can be hard work! When it comes to hair products, it really has been a case of trial and error, as you would imagine. The one thing that has stuck with me for the last 7 years though has to be dry shampoo. Not only does dry shampoo help my limp and lifeless hair by giving a bit of oomph but by using this magical product, I've gone from being an everyday shampoo'er to a every second, maybe even third day latherer. And by doing so, in washing my hair less frequently I have managed to make my vibrant rose red (la riche directions) hair last almost three times as long as it used to. I've tried many, many different brands of dry shampoo, as I've mentioned before I am a huge fan of Batiste as it's so easy to get a hold of, comes in a huge range of scents, is super affordable AND you can get little mini handbag sized bottles that are lovely for travelling - if you're anything like me and suffer from dreaded greasy hair (TMI?) or need to keep your fringe in check (Yes, dry shampoo is KEY to a perfect fringe) then you'll understand my love for Batiste. A few months ago when I was in town I decided to pick up the LUSH version - NO DROUGHT. Now, NO DROUGHT is not like your normal aerosol based dry shampoo, NO DROUGHT is a loose powder that on first glance you'd be forgiven for thinking it was plain old baby powder. Initially I found the loose powder a little intimidating as I was scared I'd look like I'd fallen into a concrete mixer but I was pleasantly surprised. This loose powder packs a mighty fine punch of citrus'y grapefruit and lime. The main ingredient in the formula is cornflower which is ideal as it absorbs the excess oil in your hair and once settled, it doesn't leave a white residue like you'd sometimes get with the aerosol style dry shampoo. As you may be able to tell from the picture, I have used this bottle for a good few months now but I'm only halfway through - a little really does go a long way with NO DROUGHT which I really love, I find when I use Batiste I go through a lot of product- perhaps half the time I spray it I'm actually missing my hair though and just don't notice? I find the citrus scent settles really well so you're not left smelling it all day - but I do apply this at night time, something I have always done with my dry shampoo - I apply it before bed and the next morning my hair feels super fresh and the product has had a chance to work it's magic. I still use my Batiste, I love both Batiste and No Drought but for different things - Batiste for when I'm looking for a quick refresh or a bit of volume but these days I always reach for my No Drought to see my hair through to the next wash and I know I'll be picking up another bottle as soon as I'm nearing the end of this one. Although, since this stuff seems to last forever, I don't see that being anytime soon. For £4.25 for 50g it's certainly good value for money. 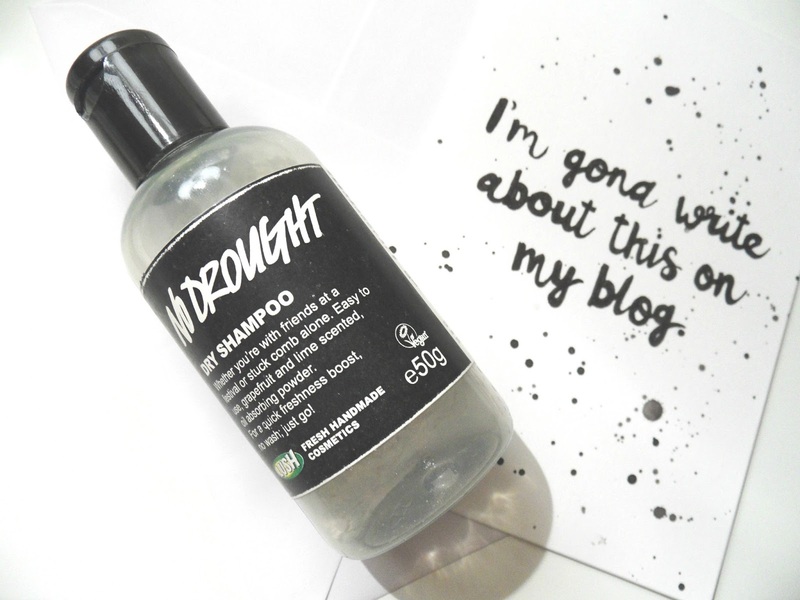 Are you a dry shampoo fiend like myself? Or have you tried any new products from LUSH recently? I've never tried this product as I'm a sucker for batiste dry shampoo but I'm a Lush addict so I know I'll have to try it at some point. I've heard mixed reviews about it so I'm egar to see what it's like.